John Gabriel – Jesus, Aristotle, Newton and Einstein all rolled into one. Praise him. Yeah. Verbatim, people, verbatim. And I don’t think he’s a troll either – he’s been doing this for years, if not decades, and he takes every piece of criticism as a personal attack. He really seems to think he is god’s gift to humanity. So, let’s continue to take him down a notch. In the second video on John Gabriel’s YouTube channel, he starts ranting about how calculus (unlike his new calculus, which is perfect in every way!) is wrong, which means I might as well use this opportunity to explain why it’s not and in general how this stuff actually works. Unfortunately (or fortunately, depending on your aesthetics) that means getting into serious math territory – many things that Gabriel gets wrong have to do with the fundamental definitions of e.g. convergence, the real numbers etc. However, if we want to see how wrong Gabriel really is, we first need to make sure that we all agree what the “official” (i.e. “right”) definitions of all those concepts are, what motivates these definitions and what their implications are. Disclaimer: I will assume that we all know and somewhat agree that rational numbers are, like, a thing – that is, numbers that can be expressed as fractions of integers . The set of all rational numbers is denoted as , the set of all natural numbers – i.e. the numbers – as . I mention this, because I will have to talk about what “real numbers” really are in modern mathematics – something that Gabriel really doesn’t seem to grasp. Also: Usually I prefer to have to be a natural number, but I specifically exclude it from here, just for convenience – it allows me to e.g. define a sequence without needing to worry about the case . Second disclaimer: I’m not a historian. I might get some, many or all of the historical details wrong. I’m writing this pretty much from the top of my head. The same holds for all definitions, proofs etc. With respect to the historical stuff, it doesn’t even matter – after all, almost everything to do with actual mathematics has changed since then, and what’s important is the motivation behind this stuff, not the precise historical development, which is why I can’t be bothered to fact check this in detail. With respect to the actual math: It’s waaay more fun to redevelop all the concepts from the top of my head, rather than looking everything up in textbooks. So don’t believe anything, check everything for yourself and see whether it works out. I’m still, like 90% sure that all my definitions are either standard or equivalent to standard definitions, so don’t reject everything I say out of hand either. Calculus was developed by Isaac Newton and Gottfried Leibniz. It’s not quite clear who invented it first; it’s not unlikely that they invented it independently of each other, inspired by similar problems. 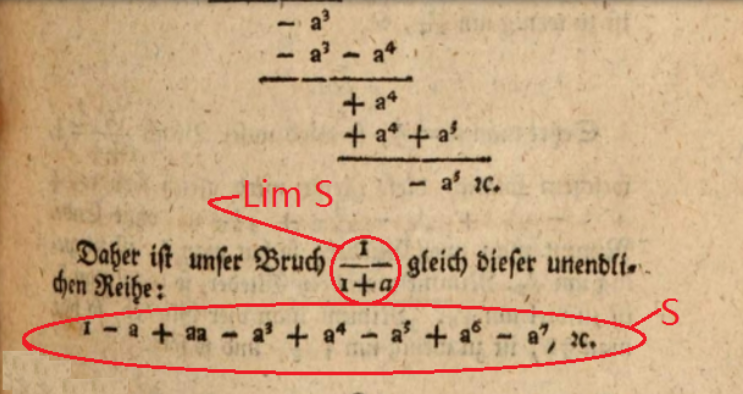 What we do know is that Leibniz published his calculus first and it’s his notations that we still use today. Newton (of course) claimed he invented it first and he used it to prove, that an inverse square law like the one in his theory of gravity would in fact imply elliptical planetary orbits. It’s an astonishing feat of intellect – this guy basically came up with a working, mathematical theory of gravity to explain planetary orbits, and invented completely new mathematics just to prove that it works. 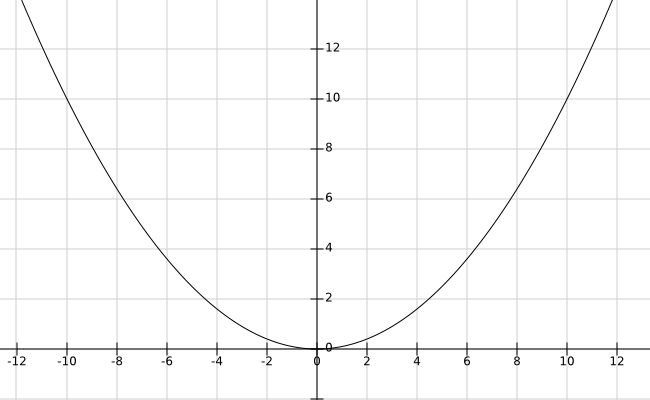 Calculus is (quote Wikipedia) the mathematical study of continuous change. Its basic objects of interest are continuous functions on the real numbers (often described as “functions whose graph can be drawn in one stroke without lifting the pen”) and its most important notions (besides continuity) are derivatives and (basically the inverse to derivatives) integrals. Nowadays, we define the latter using limits of sequences, and those we define using – –criteria, which we have to thank Augustin-Louis Cauchy and Karl Weierstrass for. 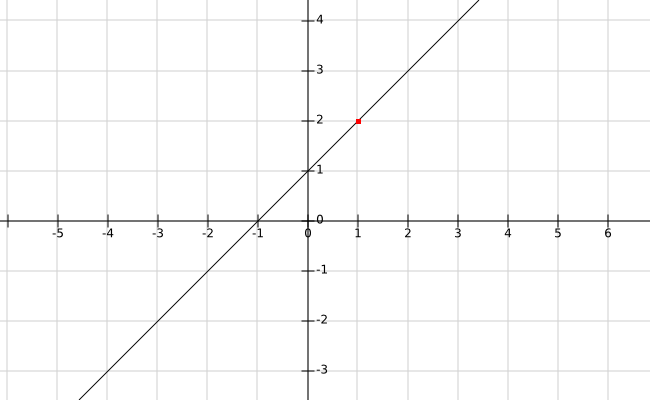 Question: What is the slope of that function at the point ? I mean, obviously the function is increasing to the right, but how fast is it increasing? Obviously it’s not increasing “at the same speed” everywhere – otherwise the graph would just be a straight line. So, how can we find out “how fast” the function is increasing at the specific point – and what does that even mean? Well, let’s look at two points instead: e.g. and . How fast does the function grow in the interval from to ? Now this we can answer: we know and . So the function has grown by . That’s an absolute growth of 2 in the interval of length . That’s how we measure speeds in practice: Note at which time e.g. a car passes a fixed point , at which time it passes a second point and divide the distance by the time it took, i.e. . This will give you the average speed in the time period from to . But of course, it doesn’t give you the exact slope at the singular point . But it might give you an idea how to get there: If we decrease the distance between and (assuming the function doesn’t do weird stuff in between), we will be somewhat closer to the exact slope. For example, if we pick , then and thus the average growth is . And here’s Newton’s and Leibniz’ mental leap: If we decrease the distance between and to the point where it is infinitesimally small, then we will get the exact slope of at the point (or – the difference between the slopes will also be infinitesimally small)! So, let’s assume we have some infinitesimally small (whatever that means), then the derivative of (i.e. 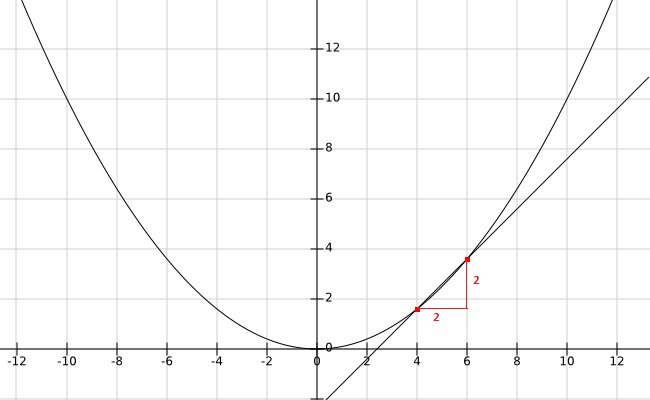 the slope of at the point ) is given by . …and (so the reasoning goes) since is just an infinitesimally small number and hence ultimately negligible, we can ignore it and get , and hence we finally get the exact value . Obviously, there are problems with that reasoning: What the hell are those “infinitesimal numbers” that are suddenly introduced, that I can can apparently add and multiply and divide by (I mean – I can’t divide by zero, but I can divide by something that’s “infinitely close” to zero? ), but then in the end I just ignore them? What’s that all about? Is this supposed to make sense? And if is “infinitesimally small”, shouldn’t that mean that would have to be infinitely large? Does that still make sense? What’s going on here? Aaaaaaaah! Well… the thing is… it sort-of works. At least for relatively simple functions as the exemplary one I used it yields meaningful results, regardless of how weird the reasoning to justify the method is. But infinitesimals were never quite satisfactory, which is why Cauchy and Weierstrass tried to put the whole thing on a more solid basis. Interestingly enough, this whole infinitesimal stuff was actually formally grounded in a rigorous way in the 20th century (and resurrected as “non-standard calculus”). But the way “standard” mathematicians interpret and think about calculus and real numbers in general is in terms of cauchy sequences, limits and – -criteria, so let’s explain the modern foundation for calculus now. Definition: A sequence of rationals is simply a function – i.e. a function that maps each natural number to some rational number . Sequences are usually denoted as (or in short just ) and the individual elements as (instead of – i.e. we just write the function argument as an index). There’s something fundamentally different about the two: Obviously, if we increase , the first sequence will strictly increase as well, while the second one strictly decreases. Okay, that’s not too interesting, but if we look closer, we notice that the first sequence is also unbounded: Pick an arbitrarily large number – at some point the first sequence will grow larger than (just pick any natural number larger than , then ). For the second sequence however, we can give a lower bound; e.g. . Even though strictly decreases, it will never become smaller than . But of course, we can give a “better” lower bound than – namely . This is also a lower bound, because all the elements of are strictly positive; hence no element will ever be . In fact, is the largest lower bound (or infimum) of the sequence, and the larger a natural number we choose, the closer the sequence element will be to . Then we say the sequence converges to and write or . If no such exists, we say the sequence diverges. Okay, this looks a bit complicated, so let’s explain it in more detail: We say a sequence converges to some number , if we can get “arbitrarily close” to by making the index of our sequence larger. This “arbitrarily close” we can express formally by thinking about it as a kind of game: You tell me how close to you want to be, by giving me an (arbitrarily small) distance . Then I’ll give you an index in return, such that all subsequent elements in the sequence are closer to than your chosen distance – i.e. for all subsequent indices , we have . If I can always give you such an initial index, no matter how small a distance you choose, then I can adequately say that the sequence converges towards . In fact, the function is equal to the function everywhere except at ! Annoying, but if we build a sequence that converges to (for example the sequence ), then we can define as the limit of the sequence (the resulting, now everywhere-defined, function is called the continuous extension of ), which happens to work out nicely and give us . Problem solved! Then we call the limit of at and write . The idea being a similar game as in the definition of convergence for sequences: You tell me any arbitrarily small distance to the (supposed) limit you want to have, and in return I will give you a distance , such that if any is closer to than , then will be closer to than . If I can always give you such a , no matter which you pick, then I win and is indeed the limit of at . …and we didn’t even touch the real numbers yet!